Joanne Harris wrote 3 fictional books about Norse mythology, specifically weaving the tales around the adventures of the gods. I came across the first book called, “Runemarks” in the audio version. My kids and I listened to it on the 12 hour drive from Calgary to Vancouver one Summer. I didn’t realize then, there was more to come. “Runelight” was the follow up book and another delightful story about the antics and personalities of the Norse gods. Then “The Gospel of Loki” was published. I thought it was the third in the series, but in fact it is the prequel to “Runemarks”. Evidently, there might be more to come. Which is fantastic because I think these stories are just wonderful. Joanne Harris is a wonderful author, of so many books, many of which are my all time favourites. (“Blackberry Wine” opens from the narrative perspective of a bottle of wine). But something about the Norse tales really captured my imagination. Within the stories, there is an over arching use of runes in a magical sense. In fact, the history of runes doesn’t rule out the magic nature that might have been perceived with their use. As language was being developed it was a rather strange situation to have symbols representing thoughts. This was met with a fair amount of concern and skepticism, in the early days. It may have felt as if someone was reading your mind. Today, the rune symbols are a bridge to the past, probably nothing more. But, like tarot cards, some people believe they can read the future from the stones. 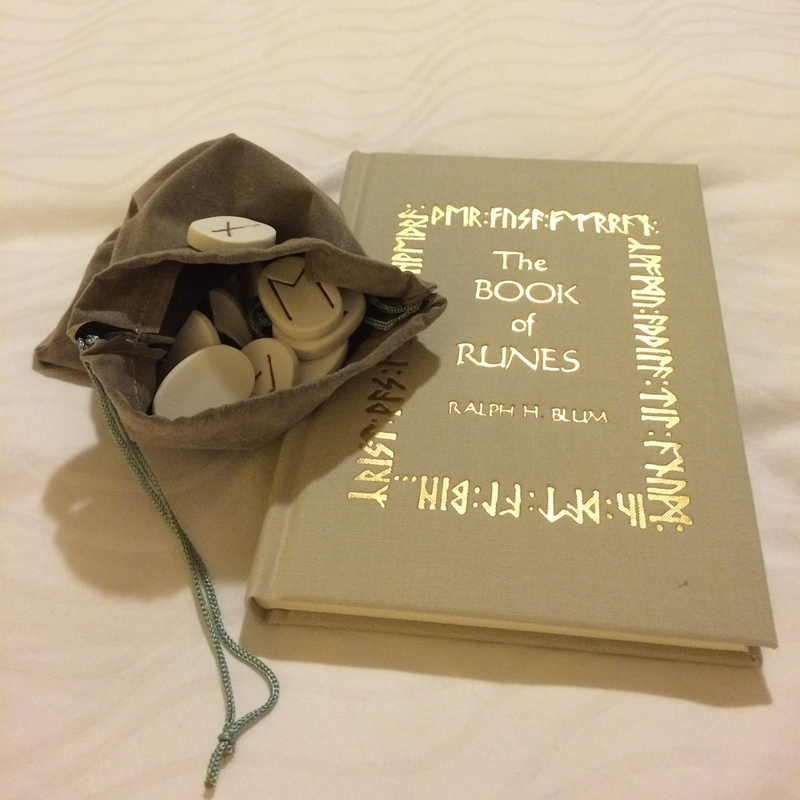 On a recent trip to New Orleans, I picked up my own bag of runes. I’ve thought that maybe I would make them, but I was lucky enough to come across a book, velvet bag and stone set. On the first day of owning my bag of runes, 4 of us women gathered around the hot tub, sitting in the sunshine on the rooftop of our hotel. We each pulled a stone and I read out the different meanings. Like other fortune telling of the trip, the stones were pretty bang on that day. It was a fun way to spend some time and gave us something to think about. I think that if I am struggling with a problem, I need all the help I can get to solve it. I am a firm believer in the notion of “sleeping on it”. My mind can work wonders in sleep to arrive at a solution that eluded me during the day. And if the runes can also cast out some ideas, then that is a good kind of magic which I could use more of in my life.